A trek in Nepal is different from most other mountain walks or climbs. 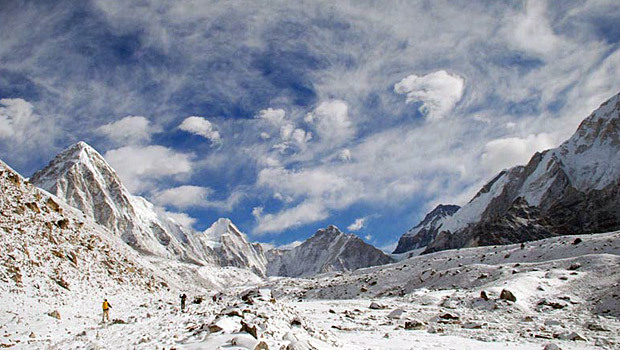 Few treks in Nepal offer a wilderness experience. Instead, you’ll be walking up and down steep hills through remote villages where farmers raise crops and herd their livestock. Even in the high Himalayan regions you’ll find herders’ huts and villages that are inhabited during the summer. Though most district headquarters, towns and many communities on important trekking routes have basic infrastructure, most villages in Nepal do not have electricity, telephones, airports or hospitals. They do have a school, a rudimentary post office and some sort of facility providing food and lodging for trekkers. Since a trek involves walking for many days, you’ll need food and accommodation along the way. You can either rely on local facilities, or you can trek with an entourage that carries all of its food and tents with it. On major trekking routes the hotel facilities are well developed and cater to basic Western standards of taste and hygiene, making it easy and practical to rely on them. In more remote regions, the facilities are local-style inns – bhattis, which can be crowded and dirty and may serve unhygienic, monotonous food. If you intend to trek off the beaten track, you will be better (and, in some places, required by government regulations) to trek with a full complement of tents, porters and camp staff. A short trek is three to seven days in duration, an average trek is two weeks, and a long trek may be 30 days or more. Every day you walk leads you one day further into the hills; unless there is an airstrip, you will also have to walk that same distance to get back. Make proper preparations before you start a trek so you don’t end up a week away from Kathmandu ill-equipped, exhausted or unable to cope with the thought of walking all that distance back. A trek is physically demanding because of its length and the almost unbelievable changes in elevation. During the 300 km trek from Jiri to Everest base camp and return, for example, the trail gains and loses more than 10 000 m of elevation during its many steep ascents and descents. On most treks, the daily gain is less than 800 m in about 15 km, although 1200 m ascents are typical of some days. You can always take plenty of time during the day to cover this distance, so the physical exertion, although quite strenuous at times is not sustained. There will always be time for rest. Probably the only physical disorder that may make a trek impossible is a history of knee problems on descents. In Nepal, the descents are long, steep and unrelenting. There is hardly a level stretch of trail in the entire country. If you are an experienced walker and often hike 15 km a day with a backpack, a trek should prove no difficulty. You will be pleasantly surprised at how easy the hiking can be if you carry only a light backpack and do not have to worry about meal preparation. Previous experience in hiking and living outdoors is, however, helpful. The first night of a month-long trek is too late to discover that you do not like to sleep in a sleeping bag. While mountaineering skills are not necessary, you should, of course, enjoy walking. Whether you begin your trek at a roadhead or fly in to a remote mountain airstrip, a portion of your trek will be in the Middle Hills region at elevations between 500 m and 3000 m. In this part of Nepal there are always well-developed trails through villages and across mountain passes. Even at high altitudes there are intermittent settlements used during summer by shepherds, so the trails, although often indistinct, are always there. You can easily trek on any trail without the aid of ropes or mountaineering skills. There are rare occasions when there is snow on the trail, and on some high passes it might be necessary to place a safety line for your companions or porters if there is deep snow. Still, alpine techniques are almost never used on a traditional trek. Anyone who has walked extensively in the mountains has all the skills necessary for an extended trek in the Nepal Himalaya. Though some treks venture near glaciers, and even cross the foot of them, most treks do not allow the fulfilment of any Himalayan mountaineering ambitions you may have. Nepal’s mountaineering regulations allow trekkers to climb 18 specified peaks with a minimum of formality, but you must still make a few advance arrangements for such climbs. Many adventure travel companies offer so-called climbing treks that include the ascent of one of these peaks. Under ideal conditions a few of these peaks are within the resources of individual trekkers. You can arrange a climb in Kathmandu if conditions are right, but a climb of one of the more difficult peaks should be planned well in advance. Next post: When to Trek in Nepal?